As summer winds down, everyone is trying to cram as many activities in as possible before the weather settles a cool mantle on the region’s shoulders (hopefully sooner than later). We sure as heck don’t want to spend these last days in the kitchen with the oven blasting more heat. 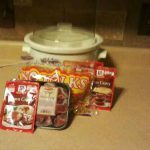 Crockpots are the busy person’s best friend. SLPL has thousands of inspiring cookbooks, with five of those specifically devoted to using crockpots. * But really, any recipe can be turned into crockpot meal. Heck, we even saw a crockpot lasagna recipe on Facebook the other day. Crockpots have a variation of spellings: Crockpot, Crock Pot, Slow Cooker, so when you are looking them up, be sure to include all spelling variations. With all that in mind, here’s a simple, easy meal (for any season, really) that takes only a tad of planning. Place brown gravy and Au Jus mixes and water a crockpot. Mix well. Add meat. Cook on low all day (8-10 hours). Prepare the noodles according to package directions. Drain. 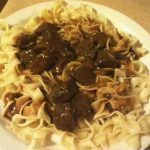 Serve meat and gravy over hot noodles. Excellent side dishes include sliced tomatoes, a side salad, cucumber and onion salad, watermelon salad, or anything cool that your family will eat. Or even better, if your family eats dessert, serve ice cream! *If you’re on a budget, stew meat works just as well. Tenderize it, though, as it has a tendency to be tough., but the long cooking time helps make it more tender. If you need to stretch the meal and aren’t interested in a side dish, add 1-2 cans (4 oz. each) sliced mushrooms (or 1 lb. fresh, thinly sliced) and/or 1 package frozen broccoli, thawed, while the noodles are cooking. If you have a cookbook that specializes in crockpot cooking, let us know. Maybe we can purchase a copy for our shelves. To suggest a purchase, click here. Be sure to check back soon for a scrumptious dinner in a dash. This week’s guest chef blogger is Julie from Marketing, who hates summer and a hot kitchen.